Dimensionality in physics is an important concept that determines the nature of matter. The discovery of graphene opened the doors of the 2D world: a place where being one-atom or two-atom thick makes a difference. Since then, several scientists became interested in experimenting with 2D materials, including magnetic materials. Spin behavior can dramatically change upon slicing down the magnet to its thinnest level, as 2D materials are more sensitive to temperature fluctuations, which can destroy the pattern of well-aligned spins. Almost 50 years ago, John M. Kosterlitz and David J. Thouless, and Vadim Berezinskii independently, described theoretically that 2D XY models do not undergo a normal magnetic phase transition at low temperatures, but a very unusual form, later called BKT transition. They realized that quantum fluctuations of individual spins are much more disruptive in the 2D world than in the 3D one, which can lead to spins taking a vortex pattern. Kosterlitz and Thouless were awarded the Nobel Prize in Physics in 2016. 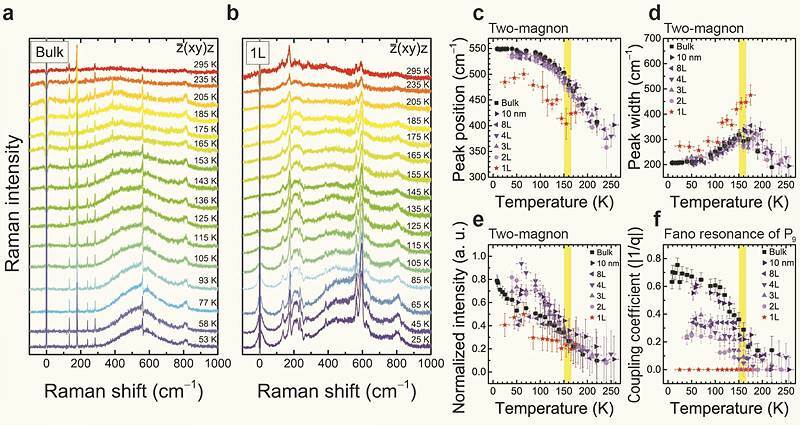 The researchers involved in this study focused on a class of transition metals that are suitable for studying antiferromagnetic ordering in 2D. Among them, nickel phosphorus trisulfide (NiPS3) corresponds to the of XY-type and is antiferromagnetic at low temperatures. It is also a van der Waals material, characterized by strong intra-layer bonds, and easily-breakable inter-layer connections. As a result, NiPS3 can be prepared in multiple layers, with a technique called chemical vapor deposition, and then exfoliated down to monolayer, allowing one to examine the correlation between magnetic ordering and number of layers. ▲ Figure 1: Spins at play. Electrons' spins in different materials might be constrained in certain orientations. The Ising model deals with spins which are pointing either up or down. The XY model explains the behavior of materials where the spins are free to move only on the x and y axis, and the Heisenberg model is about spins that point in any direction, much like clock hands. ▲ Figure 2: The comparison between bulk and monolayer NiPS3 at different temperatures.Bulk (a) and monolayer (b) NiPS3 reveal a different signature in the Raman spectra. The big peak at around 550 cm-1 in the one-atom thick sample is a sign that the magnetic ordering is lost.